Indexes News Manager posts like I18N Search indexes pages. Automatic detection of changes in News Manager (add/edit/delete/options) so index is always fresh. Configurable language of posts for News Manager stable version. Copy i18n_search_news.php file to the plugins folder of your installation. Download below and support in this thread. Thank you very much for this useful plugin. I was wondering if the plugin can renders all the NM fields, i.e. includes image and "readmore" fields. By the way, I have also some problems in showing the date fields. Indeed, the I18N search generates the "search-entry-date" div, but nothing is inside it. (2014-03-12, 23:17:42)GPB61 Wrote: Thank you very much for this useful plugin. This plugin was written initially for News Manager stable version. Now i'm working on update to use all features of News Manager last beta. Can You provide more info about this issue ? (versions of plugins and eventually url of Your project ? Btw, new version (beta) for News Manager (beta) will be released soon. Indeed, you answered both questions. The date issue was related to a misconfiguration (my fault) of the I18N search, while the other problems are related to the fact that I am actually using the beta17 of NM and therefore you still don't have those fields. Will be waiting for the next release. With News Manager 3.0 Beta20 I only get the Date, when the article was publishd, not the article itself nor a link to that article. Strange... Now it works as expected. Had the same code on my site. Deleted it, re-entered it, works... So forget about my issue. the plugin is awesome for news item search but I get &-sign displayed as &amp; in the search results and in the little example text under it. Any chance of a quick fix on this? 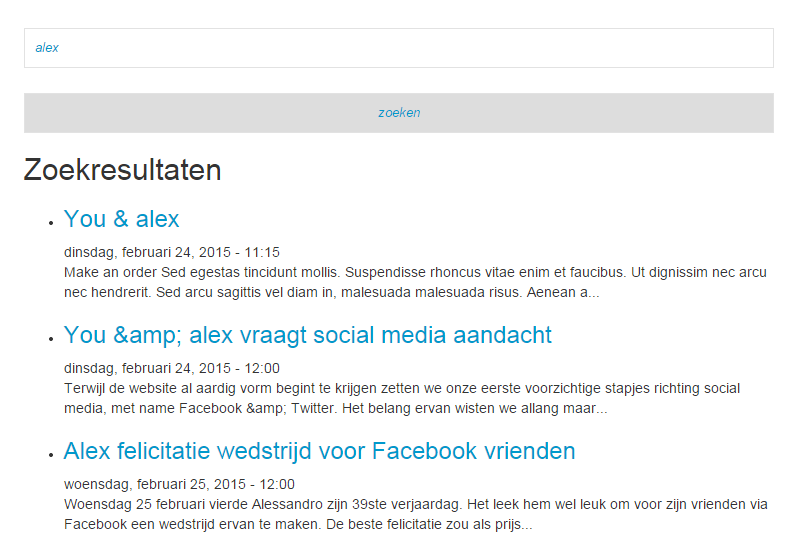 (2015-02-28, 09:35:10)dikkewalter Wrote: the plugin is awesome for news item search but I get &-sign displayed as &amp; in the search results and in the little example text under it. Any chance of a quick fix on this? It works beautifully. I hope this fix gets implemented with future updates of the plugin. For some reason, the after enabling the I18N search for news plugin, my search results aren't clickable. The search results return good results, just not clickable links. Plus, all of the results have a bullet next to them, which I'd prefer to remove. Any help, would be awesome! Do you mean that titles have no link, or that links don't work? (2015-04-29, 03:34:48)Carlos Wrote: Do you mean that titles have no link, or that links don't work? Are you using I18N Search custom rendering with a component? (2015-04-29, 04:16:19)Carlos Wrote: Are you using I18N Search custom rendering with a component? It seems that, by default, this plugin has issues if don't have the I18N (base) plugin installed. and remove the value (pl) in Language code for I18N Search Index (leave it empty).